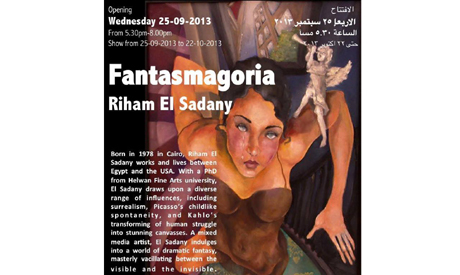 Art Talks is hosting a solo exhibition of works by contemporary Egyptian artist Riham El Sadany, running from 25 September to 22 October under the title "Fantasmagoria". El Sadany resides and works in both Egypt and the United States. Her mixed media artworks delve into a world of "dramatic fantasy," according to Art Talks. The artist "draws upon a diverse range of influences, including surrealism, Picasso's childlike spontaneity, and Kahlo's transformation of human struggle into stunning canvasss," reads the venue's press release. Featured in numerous local shows, El Sadany's work has also been displayed internationally, with exhibitions in Yemen, France, Saudi Arabia, Algeria and Malta, among others.